Much like shoelaces or dangly necklaces, DNA strands can tangle up in unruly knots. Specialized enzymes keep DNA organized when cells divide, so the cells split smoothly and don’t get stuck. But in tumor cells, this failsafe allows cancer to spread. Now, scientists at the Okinawa Institute of Science and Technology Graduate University (OIST) have learned how this mechanism works in fission yeast and how it might be undermined in human cancer. The study, published online on January 11, 2019 by the Journal of Biological Chemistry, focuses on a well-established target of cancer therapy: DNA topoisomerase II, or topo II for short. Topo II regulates the topology of DNA, managing the changing structure of the strands over time. Cancerous cells show enhanced topo II activity, which in turn spurs tumor growth. Topo II anticancer drugs suppress the enzyme’s function, prevent tumor cells from replicating and stymie cancer’s spread. But existing topo II drugs have shown limited success—scientists need to know more about the basic mechanism before they can blunt it effectively. “Many researchers are working on topo II, but they mainly using human or higher eukaryotic cells,” said Dr. Norihiko Nakazawa, first author of the study and a staff scientist in the OIST G0 Cell Unit, led by Prof. Mitsuhiro Yanagida. The Unit opted to study topo II in fission yeast because its cell division mechanisms are largely conserved in humans, he said, besides being quick and easy to manipulate. With DNA topoisomerase II (topo II) intact, DNA in fission yeast cells replicates normally and is split evenly between two daughter cells (left). 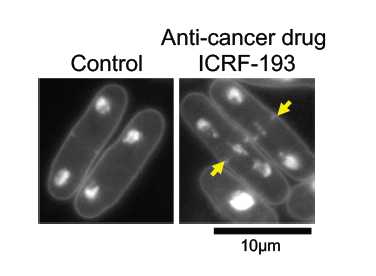 When under the effects of anti-cancer drug ICRF-193, the DNA becomes tangled in the center of the parent cell, preventing its clean division. The researchers aimed to learn how topo II operates at a molecular level. At higher magnifications, its effects are obvious; cells with the intact enzyme divide normally, with half their replicated genetic material on each side of the split. Without topo II, the DNA remains tangled in the center of the parent cell, preventing its proper division into two daughter cells. Prior research suggests that topo II relies on phosphorylation—the addition of a phosphate group at precise locations in its structure. In fission yeast and human cells, the enzyme casein kinase II, also known as CKII, steps in to phosphorylate specific regions of topo II. In this work, Nakazawa identified these regions and found that some remained phosphorylated throughout the entire cell cycle. This constant chemical exchange boosted activity in a region of topo II known as the “ATPase domain.” Though the researchers observed the enhancement, at first, they could not tell how it actually altered topo II function. DNA topoisomerase II (topo II), a master regulator of DNA metabolism for cell proliferation, is a critical target for anti-cancer therapy. The scientists solved the puzzle by throwing a topo II drug into the mix. The drug ICRF-193 works by inhibiting the ATPase activity of topo II, which effectively traps DNA in a tight configuration so it cannot perform enzymatic reactions. But in the presence of CKII, which boosts ATPase activity, the drug is rendered ineffective. Casein kinase II (CKII) phosphorylates DNA topoisomerase II (topo II), thus activating the ATPase domain of the enzyme (left). This activation cancels the effects of anti-cancer drug ICRF-193. 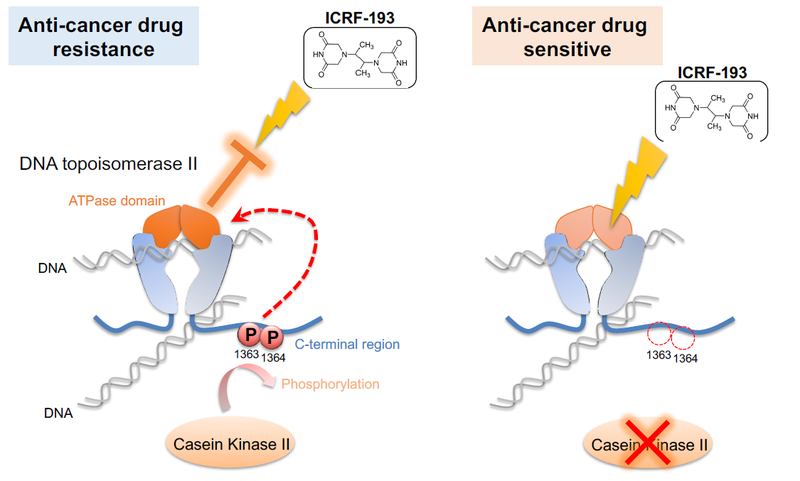 If CKII activity is attenuated (right), the efficacy of ICRF-193 is rescued. The G0 Cell Unit demonstrated this mechanism in fission yeast, a simple model that could be used for anti-cancer drug screening. Evidence suggests that topo II and CKII interact in human cells just as they do in fission yeast. Cancerous cells express higher levels of both topo II and CKII than normal tissues, and both enzymes have been associated with abnormal cell proliferation. Now that scientists understand the underlying mechanism in yeast, they can apply that knowledge in future studies in human cancer cells. Someday, the research may lead to new cancer treatments. (Left to right) Prof. Mitsuhiro Yanagida, technician Orie Arakawa, and Dr. Norihiko Nakazawa of the G0 Cell Unit authored a paper on the enzyme DNA topoisomerase II (topo II) a critical target for cancer therapy. Their experiments, conducted in yeast, revealed core mechanisms of topo II that could be exploited in future clinical studies.